There are many factors that can contribute to slow play, sometimes an effective course marshal can help speed up play. Slow play is considered by many to be one of the leading reasons why millions of golfers quit the game every year. There are many causes for slow play, but you can do your part to alleviate the problem. If you are honest with yourself about your ability and make just a few adjustments to your game, it is possible to shave as much as an hour off a round of golf. Take your ability into consideration when deciding what golf courses to play and which tee boxes to play from. If you are a 20-handicapper, avoid the most difficult courses--and play from the correct tee boxes. Struggling your way through a round slows down play for everyone. 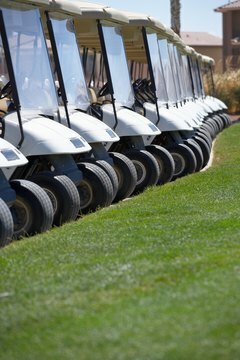 If your handicap is higher than 15, you should not be playing from the championship tees on any course. Do not wait to decide who is away when deciding who should play the next shot. If you are ready to hit your shot, hit away. Whether you are walking or in a cart, go directly to your ball. On your way, consider the club you want to hit and the shot you need to make. This approach also goes for putting. While your partners are putting, read the green and visually line up your putt. Also, if you are in a cart, take your partner to his ball. As he's preparing to hit, drive to your ball and get ready to hit. Limit practice swings on the tee, the fairway and the green. Line up your shot, take your stance, take one practice swing and prepare to hit the ball. It's estimated that players who take several practice swings before each shot add as much as 30 minutes to their round. A golf course is for playing the game, not working on your swing. Develop a pre-shot routine. Do the same things before each shot, and keep your adjustments simple. Golfers who don't have a sound pre-shot routine often fail to find a rhythm on the course. Rhythm is a key to good golf and quicker rounds. Watch the shots of other players in your group. If everyone watches the other players' shots, your group will spend less time trying to find lost balls. If you think you have hit a ball out of bounds, hit a provisional ball so you won't have to waste time returning to the tee to hit another. Helping other players look for lost balls also speeds up play. Spend no more than 5 minutes looking for a lost ball if there is a group behind you. Slow Play: What Can Be Done? How Do I Shoot Lower Golf Scores?